From saddles, boots, and shoes to jackets, luggage, or your favorite chair, Leather Therapy® will make your leather behave beautifully! Great for keeping saddles and other leather goods soft and supple, Soaks in fast and you don't need much. Doesn't revive really old stiff leather. love this stuff......keeps my tack soft supple and clean. used it on furniture, leather couches and chairs, and it worked great!!!! getting ready to start on saddles. I have used this product for 25 years at least. First on my tack and later after horses on my leather furniture, car interior, etc. I would highly recommend it to all leather users. I used this on some old leather furniture that had seen better days. With some elbow grease all three pieces look like new. Can't wait to use it in my car come spring. This stuff works great! I cannot saying enough amazing things about this product!!! I have been using this on my 40+ year old saddle, and it looks better than some of my friend's saddle. My saddle and bridle are never sticky after i clean them, which I can't say for some other cheaper products. It is well worth the money when you consider how often we all use our boots, half chaps, bridles, saddles, etc. I am so happy that my trainer recommended this product about 15 years ago, I've been a loyal customer ever since!!! Thank you leather therapy for keeping my first saddle ever in tip top shape, and my horse and I riding in clean tack that is a breeze to clean after (almost) every ride. It is well worth it to invest in this cleaner! If you held the bridle sideways by the headpiece, the cheek pieces and throatlatch stood straight out. It was stiff. Two applications of leather therapy restorer, and the bridle is supple enough that I would actually put it on a horse's face. Good product, though the price is a little hard to swallow at first. If you need to restore your valuable leather goods though, it's probably worth it. I got interested in this product as it is to help with mold and mildew. We keep our underused tack in the basement and it tended to get mildew on it over time. I have been using this product and I think it helps. I love the way it makes the leather feel. I plan to keep using it. I had a saddle that went moldy and i tried everything to get the mold out from soaking it in vinagar to and all kind of mold remover i was just about to give up when i found this stuff and i used the leather therapy wash and then i use the leather therapy conditioner it has been the best saddle cleaner ive ever used love this stuff the mold never came back and it looks as good as new i would recommend this stuff with pride and you want regret getting it. the price was a little high but well worth it. I just bought a used but good condition saddle and it needed some TLC. I used your product and it looks like it is a new saddle. your product brought back the leather and detail on the saddle, I am very pleased. Really works to keep leather healthy. This is the best product I have found to restore and maintain my older and less often used equipment and boots. It softens the leather and is not greasy. It is a little expensive, but I don't use it every day like saddle soap, it is for more long term applications, so the price is definitely reasonable. Works great. Turned the older dry leather soft & supple again. Seems to have stopped the mildew that was starting on two spots under the saddle. (Be sure to shake the bottle FIRST, which I failed to do the first time I used it). I had to apply it twice (which only took about 5-10 mins each time). After the 2nd time, the excess that did not soak into the saddle was easily wiped away with a cloth rag. Next morning it was dry to the touch and felt like new leather again. It did (slightly) darken the leather, as you would expect putting a liquid or lotion directly on leather. But not much. This product works exactly as stated. I did use the leather wash first and followed up with leather conditioner. I would recommend getting both products if you have a mold issue. I had excellent results on my green moldy saddle. Greatest Thing Since Sliced Bread!! I used this product on an English saddle that was covered in mildew and it came out looking like new! Cleans and beautifully conditions the leather. Highly, Highly recommend this product. This conditions so well, wish I had discovered it years ago. I bought the 12 pack of tack sponges, spray directly on the sponge and rub in. Also used and love the Leather Therapy Wash. Will definitely buy again! Best leather care on the market! 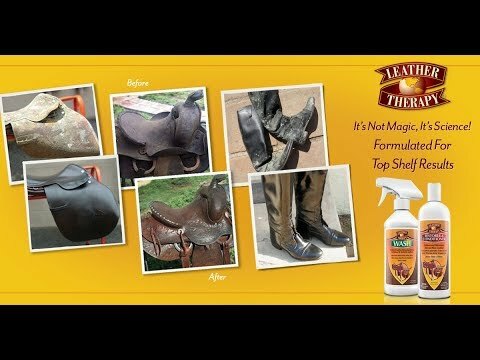 Leather Therapy has done their research and designed a product that supples and strengthens leather and leaves a light protective coating that is not greasy. It even does a great job with crackly, mildew laden tack (use the "Wash" first). LT has a lot of great leather care articles on their website, too. This product works great. I have some older harness and leather items that have gotten stiff and Leather Therapy and Restorer & Conditioner does a wonderful job of restoring life back into the leather. Was highly recommended and really keeps the saddles looking great. Works on very used tack! Looking for a better way to care for older leather items. I had some leather products that were not being used and getting stiff and moldy. This was great to restore and condition the leather and stop mold from growing on it. I use it on all my saddles and bridles before I store them for the winter. 2 dollars cheaper than anywhere else I can find. Plus the larger pump bottle is available on horse.com. I havent found that choice available anywhere else. BEST ANSWER: Clean the saddle with saddle soap. Let dry well. Then warm up some olive oil (in the microwave - just warm only). Keep applying the olive oil. It will absorb and absorb. Keep buffing and applying. You can use this product afterwards to keep it in shape but you really, really have to get that leather back in shape. Olive oil won't change the color of the leather but Neatsfoot oil which I also like, might change the color since the leather has to be very dried out due to the storage conditions this saddle has been in. I would start with Lexon cleaner (single bottle will be plenty) then condition with mink oil paste applied over several days until it's getting pretty well oiled (may need 2-3 cans depending on amount of leather & dryness), finish off with a couple coats of Leather Therapy Restorer & Conditioner (small bottle should be enough) to add shine, protection & inhibit mold. This is a very good product to help restore leather. It's recommended for use on clean leather, so you would want a thorough cleaning with saddle soap first. As for the quantity, it would depend of course on the leather's condition, but Leather Therapy recommends to use their product sparingly for best results. Hope this helped! I doubt that anything will help, but Leather Therapy Restore and conditioner is probably the best bet to try. Put it on in light coats a day or so apart when weather is warm, not damp or cold. A little of this goes a long way, so probably the 12 oz size (if they make it) would be plenty. Also it is good for shoes and boots. Clean the leather with Lexol cleaner to get the dirt off. I use the big pump bottle of restore. Leather Therapy. It is awesome. I also spray leather new under and in between so the saddles won't creak. Definitely Leather Restorer and conditioner. It's more expensive than some others, but worth it. I love the Akene products, especially the conditioner. Restoration everything I ever had! So, are you supposed to use the Leather Therapy Wash first to clean your saddle, tack, whatever,...? And then follow-up with the Leather Therapy Restorer and Conditioner? Or are you supposed to use the two products together or just use the one that meets your needs the best? I'm confused. LoL! You can use a 3rd product if you desire either Finish OR their water proofing spray. I use these products on my Martin saddle. I used the wash the first time and followed up with the Restorer/Conditioner. Subsequently, I've used whichever fits the situation. This works great too! It was really wet last summer and everyones' tack was getting mold on it. Once I used the Leather Therapy on mine it never came back! I use the wash to first clean and remove any mildew or residue then follow up with the Restorer and Conditioner. I love this product better than all others I have tried and I've had horse tack for the last 40 years. Everyone has their own preference...................most people seem to first use some kind of leather soap or cleaner, followed by their preferred conditioner. There are also some combination products. you should probably use the wash first then the conditioner. However, I personally, do not recommend this product. it had made my saddle really sticky, it could have just been my tack though. Use the wash first, then the restorer and conditioner. Can this be used on bits? BEST ANSWER: Would not recommend it. It is for leather products. I use ajax or comet on my stainless steel bits then rinse thoroughly. No. Leather products only. There is a bit cleaner available by another manufacturer. This product is not intended for use on bits. I would not recommend using it on a bit. No, it is for leather. is this safe for my aniline leather couch?? BEST ANSWER: It probably is, but to be on the safe side, please test it on an inconspicuous or hidden area of the couch first. my couches take it tough with 2 dogs in house with me and they were showing signs of wear, Look like new now! Does California restrict shipping this product leather therapy restorer & conditioner? BEST ANSWER: There are no shipping restrictions on this item at this time.